Wickenburg's Wild West 5k/ 10k / Half Marathon & Kids' Fun Run will follow an out-and-back course beginning at Sunset Park (3020 W. Wickenburg Way, Wickenburg, AZ 85390). The half marathon will begin at 6:30am. The 10k event will start at 7:00am, followed by the 5k race at 7:15am. The route heads east from Sunset Park, following the multi-use path near the entrance of the park. The course follows the gradually descending path east until reaching the 5k turnaround point just short of Vulture Mine Road. At Vulture Mine Road, 10k and half marathon participants will head south (running on the west side of the road). With the majestic Vulture Peak off in the distance, runners will face a gradual climb in elevation until reaching the respective turnaround points. 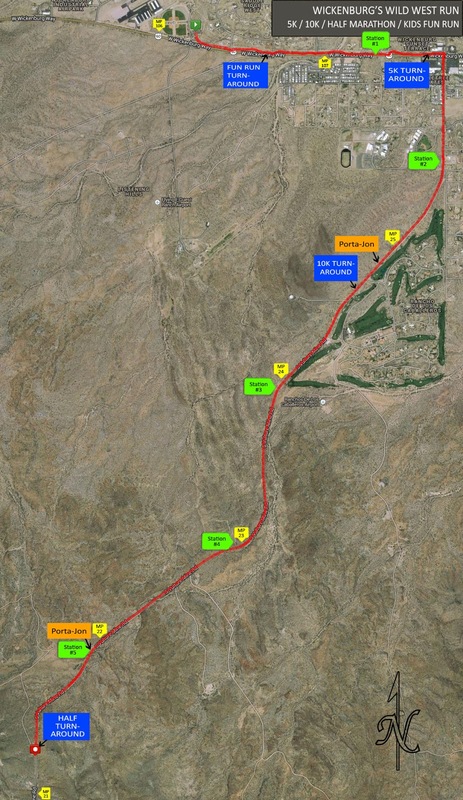 From the intersection, 10k contestants will continue for 1.55 miles before turning around just beyond Wickenburg's Los Caballeros Golf Course, while half-marathon runners will continue through Wickenburg's scenic terrain and gently rolling hills for another 3.45 miles before turning back. Having gradually ascended above the town, the turnaround gives participants a picturesque view of the town and it's surrounding beauty. You won't find a more beautiful run in all of Arizona. So enjoy the run while you're out, but ya'll come back for a wild west finish of fun at Sunset Park. The Kids 1-Mile Fun Run will begin at 9:30am from Sunset Park. One adult may accompany each child on the race course, if desired. The Fun Run will utilize the same multi-use path and will turn around a half mile out and then return to the start/finish line. The one-mile course does not cross any intersections. Click image to learn more.